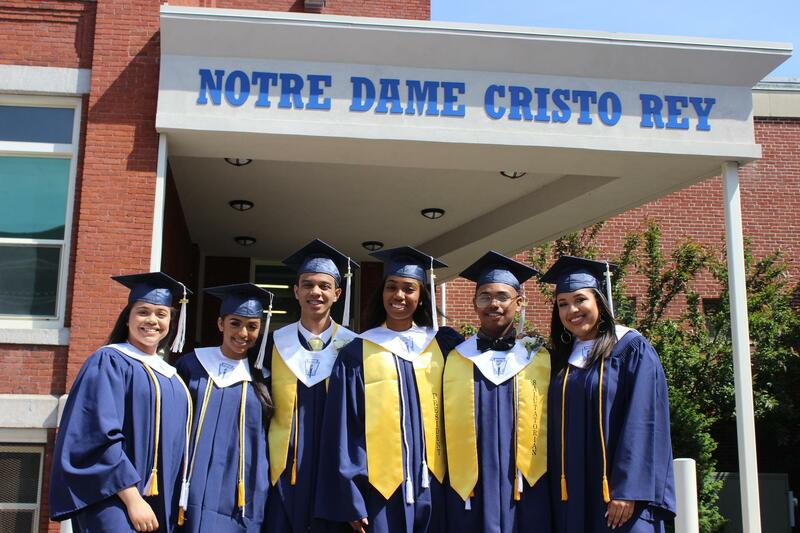 Notre Dame Cristo Rey High School (NDCR), located in Lawrence, MA, is a not-for-profit corporation which is sponsored by the Sisters of Notre Dame de Namur US East-West Province, a division of the international community of the Sisters of Notre Dame de Namur. NDCR is a member of the Cristo Rey Network. Cristo Rey Network Catholic schools bill themselves as "schools that work." This is, quite literally, the truth. The bedrock of a Cristo Rey model high school is the Corporate Work Study Program which places students with low income status into entry level administrative positions and generates much needed revenue for the school. At full enrollment, Cristo Rey Network high schools are able to cover nearly 80% of their operating expenses through the work program and a modest tuition. Established in 2004, NDCR has provided an opportunity for hundreds of youth in the Lawrence, MA area to be educated through a rigorous Catholic, college preparatory curriculum. Through the work of highly dedicated faculty and staff, the high school continues to celebrate 100% college acceptance of its students into four-year colleges and universities. Contact us for more information or to set up a time to come visit!